The Nobel may be Sweden's most famous prize, but the Retzius medal is also quite an honor. Every three years on April 24th, the anniversary of the Swedish-Finnish geographic explorer Nils Adolf Erik Nordenskiöld's return with his ship Vega to Stockholm, the Swedish Society for Anthropology and Geography (SAAG) bestows the Anders Retzius gold medal on a scholar they believe has made a significant scientific contribution to anthropology. In the intervening years, a physical and a human geographer are recognized. Previous recipients of this honor include Frederik Barth (1988), David Harvey (1989), Veena Das (1995), Sherry Ortner (2001), Doreen Massey (2003) John and Jean Comaroff (2007) and Ulf Hannerz (2010) among a slew of others. That the award this year goes to Paul Stoller is particularly noteworthy because his work is somewhat outside the mainstream of anthropology. His response to the official notification was rather typical of his well-known humility and consistent optimism in the discipline. He said, "The notification came as a complete shock. The process of deliberation is secret... Aside from the shock, it feels wonderful to have my contributions recognized. My own feeling has been that my work has been on the margins of an anthropology that hasn't put a premium on storytelling and narrative and how they bring us to the center of what matters existentially in social life. Perhaps this award means that the discipline is taking the narrative dimension more seriously than in years past." Stoller, Professor of anthropology at West Chester University in Pennsylvania, has conducted extensive field research on religion and magic in Niger and Mali as well as among African immigrants in New York City. An expert and leading thinker in the fields of economic, reflexive and visual anthropology and anthropology of the senses, he is the author of eleven books spanning from ethnographies and biographies to memoirs and novels that include In Sorcery's Shadow (with Cheryl Olkes), The Taste of Ethnographic Things, Embodying Colonial Memories, The Cinematic Griot, Jaguar: A Story of Africans in America, Stranger in the Village of the Sick, Money Has No Smell among others, and too many refereed articles to count. He is also a most prolific HuffPo blogger. During his thirty years in anthropology, Stoller has always experimented with writing, believing there is no single way to write about the human experience. 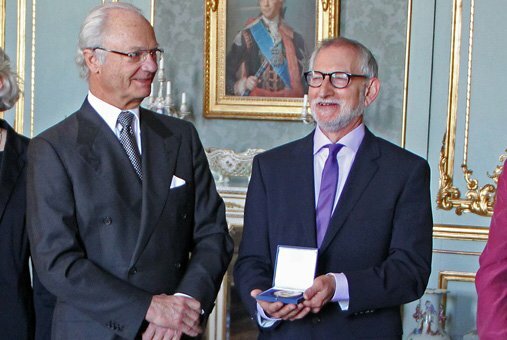 On Tuesday, he received the medal from His Majesty King Carl Gustav of Sweden. Yesterday's VEGA day festivities included a symposium on "anthropology and well-being" the theme he chose inspired by Yaya's Story: The Quest for Well Being in the World, his latest and recently completed book. Contemplating this decision, he noted, "it is surprising to me that anthropologists have paid so little direct attention to the issue of well being, something that is of universal concern. So I wanted the symposium participants to reflect on the notions and practices of well being." To that end, Stoller invited fellow anthropologists, David Napier (University College London), Kirin Narayan (University of Wisconssin-Madison) and Helena Wulff (Stockholm University) to speak on this issue. He says, they "have been thinking and writing about well-being for a very long time and have wise things to say about the matter." The chair of the symposium was Uppsala University's, Sten Hagberg. Anthropology will continue to get a bad rap as long as we anthropologists think and write about the human condition in obtuse ways. When I talk about my life in anthropology and the people I have come to know and love over the years, I find people in the audience moved--not because what I had to say was particularly brilliant, but because I opened my experience--my joy and pain and that of my Nigerian friends--to them and such an opening established a connection. At my last several talks, I seen people shed a tear to two when I talk about the depth of my ethnographic experience and the depth of the humanity of my Nigerian friends. That kind of connect is usually missing in anthropological accounts. In my view of things, this connect should be the centerpiece of what we do. In response to the tendency to measure the discipline's value in terms of the market, Paul remained as frank: "I'm not sure how anthropology fits into the contemporary market economy. But I do know that if we don't pay heed to what anthropological knowledge can teach us, it impoverishes social life and social relations, making us less able to find a measure of well-being in life, less able to be comfortable in our skins." Decades ago, I came across his work by way of my doctoral advisor, Ruth Behar. It wasn't until years later however that his intellectual influence began to take hold as I started to confront the limits of one form (ethnography) and began to explore then embrace another (performance). In the last few years, we have had conversations about the significance of anthropology, doing work that matters while maneuvering the boundaries of the discipline. I remain curious about the centrality of Stoller's interest in West Africa and how he manages to maintain this connection. He said, "I have been dedicated to Niger for a very long time. The reason for this long-term commitment is simple: I fell in love with Niger and the people I met there. My work is quite frankly a measure of that love, and the depth of my experience there of love and loss, courage and fear, fidelity and betrayal--the real of stuff of human relations." Understanding human relations may have low market value in the vocational push trending in contemporary education but anthropology still matters if for no other reason than the fact that the discipline continues to unravel the complexity of the fictive distance that has historically and socially limited us as a species. Evidence of this could not be more apparent than in the medal's namesake Anders Retzius, an anatomist and anthropologist. Retzius was a polygenist whose work and that of his forbearers was foundational to scientific racism. Indeed, anthropology has changed and certainly will continue to do so in ways that have significant impact upon the world. Stoller remains one of the discipline's biggest advocates. It's not surprising then that his advice to new anthropology majors is so deeply grounded in the stuff of human relations. He suggests: "open your being to experience--as challenging and frightful as that may be--and let that experience guide you in a direction that makes you feel comfortable in your skin. In that state you are much more likely to communicate stories that will remain open to the world, stories, lessons and themes that your successors will dote upon and use in a way that fits their time. As my teacher Adamu Jenitngo liked to remind me: remember the past, live well in the present and think about the future..."